Under Ögedei, the Mongol Empire conquered Eastern Europe. Various tactical errors and unexpected cultural and environmental factors stopped the Mongol forces from moving into Western Europe in 1241. Ögedei Khan, Genghis Khan ‘s third son, ruled the Mongol Empire from 1227 CE-1241 CE. Under Ögedei, the Mongol Empire conquered Eastern Europe by invading Russia and Bulgaria; Poland, at the Battle of Legnica; and Hungary, at the Battle of Mohi. Changes in the terrain and resources, which limited their cavalry abilities, along with the death of a charismatic leader Ögedei in 1241, brought these forces to a halt before they reached Western Europe. Rus’: Early Russia; encompassed modern-day Russia, Ukraine, Poland, Belarus, and the Baltic states. steppe: The grasslands of Eastern Europe and Asia. Similar to the North American prairie and the African savannah. “Coronation of Ögedei”: “Coronation Of Ögedei,” 1229, by Rashid al-Din. Ögedei, Genghis Khan’s third son, took over from his father and ruled the Mongol Empire from 1227 CE-1241 CE. One of his most important contributions to the empire was his conquest of Eastern Europe. These conquests involved invasions of Russia, Hungary, Volga Bulgaria, Poland, Dalmatia, and Wallachia. Over the course of four years (1237–1241), the Mongols quickly overtook most of the major eastern European cities, only sparing Novgorod and Pskov. As a result of the successful invasions, many of the conquered territories would become part of the Mongol Empire. This conquered region is sometimes referred to as the Golden Horde. The operations were masterminded by General Subutai and commanded by Batu Khan and Kadan, both grandsons of Genghis Khan. The Mongols had acquired Chinese gunpowder, which they deployed in battle during the invasion of Europe to great success, in the form of bombs hurled via catapults. The Mongols have been credited for introducing gunpowder and associated weapons into Europe. They were also masters at cavalry invasions and siege warfare, which threatened many of the principalities the Mongols hoped to capture. Ögedei Khan ordered his nephew (and grandson of Genghis Khan) Batu Khan to conquer Russia in 1235. (The territory was then called Rus’ and encompassed modern-day Russia, Ukraine, Poland, Belarus, and the Baltic states. Territories and cities were ruled over by princely dynasties, which often meant these regions were fragmented politically.) The main force arrived at Ryazan in December 1237. Ryazan refused to surrender, and the Mongols sacked it and then stormed through other Russian cities, including Vladimir Suzdal in the north, and Pereyaslav and Chernihiv in the south. Other major Russian cities—such as Torzhok, and Kozelsk—were captured between 1238 and 1240. Some cities, such as Novgorod in the north, were not attacked due to the dense march and forest land surrounding it. However, the princes ruling Novgorod acted as tax collectors for the Mongol Empire in the coming decades. Afterward, the Mongols turned their attention to the steppe, crushing various tribes and sacking Crimea to the west. They returned to Russia in 1239 and sacked several more cities and finally took the southern Rus’ capital of Kiev, leaving behind their trademark destruction of both the population and city structures. This final attack sealed the Rus’ principalities’ fate, forcing princes to flee their regions or capitulate to Mongol taxation and rule. The Battle of Legnica: A depiction of the Battle of Legnica by Matthäus Merian the Elder, painted 1630. The Mongols continued to invade Central Europe with three armies. One army defeated the fragmented Poland at the Battle of Legnica in 1241. Two days later the armies regrouped and crushed the Hungarian army at the Battle of Mohi, killing up to a quarter of the population and destroying as much as half of the habitable dwellings. This decisive victory was partially due to the fact that Hungary was unprepared for an invasion and did not having a standing army ready to fight. It took a number of months for the Mongol army to subdue various power centers in Hungary. A major battle called the Mongol’s Siege of Esztergom in the capital of Hungary forced people to flee and a new capital was moved to Budapest. However, the Mongols had a difficult time capturing fortified cities throughout Hungarian territories, which kept a total takeover from occurring. The Hungarian king Bela IV fled to Croatia during the initial attacks on his cities, and fortified structures throughout this territory helped keep the king and the local populations safe. However, Zagreb was sacked and destroyed in pursuit of the fugitive king and further territorial gains. While the Mongol armies were fighting in Hungary and Croatia, they also pushed their forces into Austria, Dalmatia, and Moravia. Where they found local resistance, they ruthlessly killed the population. Where the locale offered no resistance, they forced the men into servitude in the Mongol army. They also ransacked Moldavia and Wallachia, plundering food stores and leaving the population in a precarious state. Although the Mongol forces were well-versed in cavalry and siege attacks, these two strategies also served as their weak points as they went farther westward. Many people in Hungary, Croatia, and Dalmatia had food stores at the ready for the long siege battles of the Mongol armies. Fortified cities and boggy or mountainous terrain also slowed down the light cavalry of the Mongol forces and gave European cities an advantage. Although politically fractured, European powers were uniting; even Hungarians who had survived the initial attack, or never engaged in battle, had begun a guerilla attack lead by survivors of the Hungarian royal family. The Klis Fortress in Croatia: This type of rocky, fortified city posed a serious challenge to Mongol forces who were often mounted on horses. This particular city defeated the Mongol army in 1242. Along with all of these tactical challenges the charismatic Mongol leader, Ögedei, died in December 1241. His death forced the Mongol armies to halt their westward expansion, especially in the face of mounting difficulties, and hasten back the thousands of miles to Karakorum, their capital in Mongolia, to elect his successor. Although the expansion did not extend into Western Europe, the Mongol forces retained power over many major Eastern European cities for many decades. However, after Ögedei’s death, power disputes plagued the Mongol Empire and eventually weakened their extensive hold on such vast territories. Möngke was generally a popular ruler of the Mongol Empire; he met debts, controlled spending, conducted a census, and protected civilians. After Ögedei’s death, Genghis Khan ‘s descendants Güyük and Batu Khan fought about who would rule until Batu Khan’s death, at which point Genghis’ grandson Möngke took control. Möngke was generally a popular ruler. He generously met all Güyük’s outstanding debts, an unprecedented move. Möngke also forbade extravagant spending, imposed taxes (which incited some rebellions), and punished the unauthorized plundering of civilians. He established the Department of Monetary Affairs and standardized a system of measurement. Möngke conducted a census of the Mongol Empire and its land. ingot: A block of steel, gold, or other metal oblong in shape and used for currency. Department of Monetary Affairs: Möngke established this body to control the issuance of paper money in order to eliminate the overissue of currency that had been a problem since Ögedei’s reign. From Ögedei’s death in 1241 CE until 1246 CE the Mongol Empire was ruled under the regency of Ögedei’s widow, Töregene Khatun. She set the stage for the ascension of her son, Güyük, as Great Khan, and he would take control in 1246. He and Ögedei’s nephew Batu Khan (both grandsons of Genghis Khan) fought bitterly for power; Güyük died in 1248 on the way to confront Batu. Another nephew of Ögedei’s (and so a third grandson of Genghis Khan’s), Möngke, then took the throne in 1251 with Batu’s approval. In 1255, well into Möngke’s reign, Batu had repaired his relationship with the Great Khan and so finally felt secure enough to prepare invasions westward into Europe. Fortunately for the Europeans, however, he died before his plans could be implemented. Forbade extravagant spending and limited gifts to the princes. Made merchants subject to taxes. Prohibited the demanding of goods and services from civilian populations by merchants. Punished the unauthorized plundering of civilians by generals and princes (including his own son). Limiting the overissue of currency, which had been a problem since Ögedei’s reign. Standardizing a system of measurement based on the silver ingot. Paying out all debts drawn by high-rank Mongol elites to important foreign and local merchants. The Mongol Empire’s administration followed a trend that was occurring in the Western Europe, in which kings and emperors were finding efficient ways to manage their administrative and legals systems and fund crusades, conquests, and wars. From 1252–1259, Möngke conducted a census of the Mongol Empire including Iran, Afghanistan, Georgia, Armenia, Russia, Central Asia and North China. The new census counted not only households but also the number of men aged 15–60 and the number of fields, livestock, vineyards, and orchards. Möngke also tried to create a fixed poll tax collected by imperial agents, which could be forwarded to the needy units. He taxed the wealthiest people most severely. But the census and taxation sparked popular riots and resistance in the western districts and in the more independent regions under the Mongol umbrella. These rebellions were ultimately put down, and Möngke would continue to rule. At the death of Genghis Khan in 1226, the empire was already large enough that one ruler could not oversee the administrative aspects of each region. Genghis realized this and created appanages, or khanates, for his sons, daughters, and grandsons to rule over in order to keep a consistent rule of law. Möngke’s administrative policies extended to these regions during his reign, often causing local unrest due to Mongol occupation and taxation. Some khanates were more closely linked to centralized Mongol policies than others, depending on their location, who oversaw them, and the amount of resistance in each region. 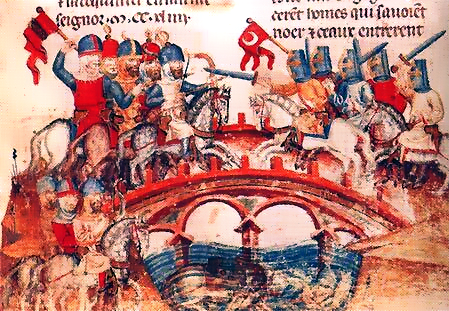 Painting of the Battle of Mohi in 1241: Möngke might have been present at this battle, which took place in the kingdom of Hungary, during one of the many Mongol invasions and attacks that expanded the Mongol Empire. The Golden Horde, which contained the Rus’ principalities and large chunks of modern-day Eastern Europe, including Ukraine, Belarus, and Romania. Many Russian princes capitulated with Mongol rule and a relatively stable alliance existed in the 1250s in some principalities. Chagatai Khanate was a Turkic region which was ruled over by Chagatai, Odegei’s second son, until 1242 at his death. This region was clearly Islamic and functioned as an outlying region of the central Mongol government until 1259, when Möngke died. Ilkhanate was the major southwestern khanate of the Mongol Empire and encompassed parts of modern-day Iran, Azerbaijan, Armenia, and Turkey and the heartland of Persian culture. Möngke’s brother, Hulagu, ruled over this region and his descendants continued to oversee this khanate into the 14th century. Möngke died while conducting war in China on August 11, 1259. He was possibly a victim of cholera or dysentery, however there is no confirmed record of the cause of his death. His son Asutai conducted him back to Mongolia to be buried. The ruler’s death sparked the four-year Toluid Civil War between his two younger brothers, Kublai and Ariq Böke, and also spurred on the division of the Mongol Empire. Kublai Khan came to power in 1260. By 1271 he had renamed the Empire the Yuan Dynasty and conquered the Song dynasty and with it, all of China. However, Chinese forces ultimately overthrew the Mongols to form the Ming Dynasty. Möngke’s death led to civil war (or Toluid Civil War) between his two younger brothers; ultimately, Kublai Khan emerged victorious and renamed the empire as the Yuan Dynasty in 1271. Kublai also renamed himself Emperor of China in order to win over millions of Chinese subjects. Ultimately, under Kublai Khan, the Mongols were the first non-Chinese people to conquer all of China. However, their conquests of Japan and Java failed. At the time of Kublai’s death, the Mongol Empire fractured into four separate empires; this made it easy for the Han Chinese to overthrow them in 1368 and establish the Ming Dynasty. Kublai Khan: A portrait of a young Kublai Khan by Anige, a Nepali artist in Kublai’s court. Möngke’s death in 1259 led to civil war (often referred to as the Toluid Civil War) between his two younger brothers, Kublai Khan and Ariq Böke. Kublai Khan emerged victorious and established the Yuan Dynasty in China in 1271, perhaps the Mongols’ greatest triumph, though it would eventually be overthrown in 1368 by the native Han Chinese, who would launch their own Ming Dynasty. After Kublai took over control of the Chinese territories with the blessings of Möngke Khan around 1251, he sought to establish a firmer hold on these vast regions. Rivaling dynasties loomed throughout the Chinese territories making for a contentious political background to Kublai’s rule. His greatest obstacle was the powerful Song dynasty in the south. He stabilized the northern regions by placing a hostage puppet leader in Korea named Wonjong in 1259. After the death of Möngke in that same year, and the following civil war, Kublai was named the Great Khan and successor of Möngke. This new powerful position allowed Kublai to oversee uprisings and wars between the western khanates and assist rulers (often family members) to oversee these regions. However, his tenuous hold in the east occupied most of his resources. In 1271, as he continued to consolidate his power over the vast and varying Chinese subjects and outlying regions, Kublai Khan renamed his khanate the Yuan Dynasty. His newly named dynasty appeared to be successful after the fall of the major southern center Xiangyang in 1273 to Mongol forces after five years of struggle. The final piece of the puzzle for Kublai was the conquest of the Song Dynasty in southern China. He finally garnered this sought-after southern region in 1276 and the last Song emperor died in 1279 after years of costly battles. With this success, the Mongols became the first non-Chinese people to conquer all of the Chinese territories. Kublai moved his headquarters to Dadu, what later became the modern city of Beijing. His establishment of a capital there was a controversial move to many Mongols who accused him of being too closely tied to Chinese culture. 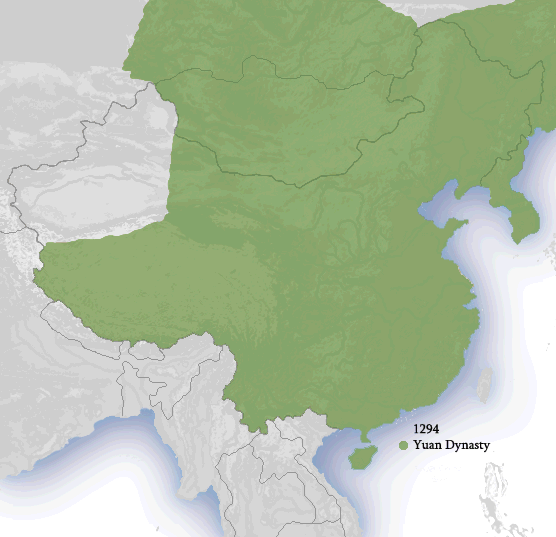 However, the Yuan Dynasty often functioned as an independent khanate from the rest of the western Mongol-dominated regions. Yuan Dynasty circa 1292: The sheer scale of this khanate required extensive military support and often strained the Mongol treasury in order to keep populations under its influence. Kublai Khan’s costly invasions of many territories in the east did not go smoothly and some went on for many years, draining the Mongol treasury and utilizing precious resources. Although the invasions of Burma in 1277, 1283, and 1287 forced the population to eventually capitulate, they were never more than a vassal state. Similarly, the Yuan forces invaded Sakhalin Island off the coast of modern-day Russia multiple times between 1264 and 1308, and the various tribal groups also eventually became a vassals after long years of turmoil. Southern Asian regions often agreed to Yuan rule and taxation only in the face of more bloodshed and terror. Conversely, Mongol invasions of Japan (1274 and 1280) and Java (1293) under Kublai Khan ultimately failed and illustrated the costly effects of constant invasive military tactics. Kublai Khan made significant reforms to existing institutions under the Yuan Dynasty. He divided the Dynasty’s territory into a central region and peripheral regions that were under the control of various officials. He created an academy, offices, trade ports and canals, and sponsored arts and science. Mongol records also list 20,166 public schools created during his reign. 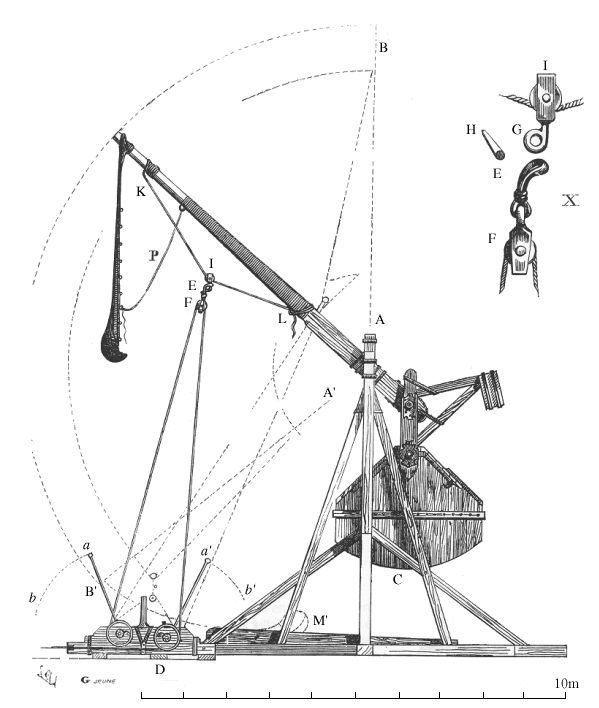 He also, along with engineers, invented the Muslim trebuchet (hui-hui pao), a counterweight-based weapon that was highly successful in battle. He also continued to welcome trade and travel throughout his empire. Marco Polo, Marco Polo’s father (an Italian merchant), and his father’s trade partner traveled to China during this time. They met Kublai Khan and lived amongst his court to establish trade relations. Polo generally praised the wealth and extravagance of Khan and the Mongol Empire. Some historians also speculate that trade was so accessible between the empire and Europe, that it may have contributed to the flow of disease, especially the black plague in the mid-1300s. Trebuchet: The scheme of the “Muslim trebuchet” (hui-hui pao), invented during Kublai Khan’s rule. By the time of Kublai’s death in 1294, the Mongol Empire had fractured into four separate empires, which were based on administrative zones Genghis had created. The four empires were known as khanates, each pursuing its own separate interests and objectives: the Golden Horde Khanate in the northwest, the Chagatai Khanate in the west, the Ilkhanate in the southwest, and the Yuan Dynasty, based in modern-day Beijing. In 1304, the three western khanates briefly accepted the rule of the Yuan Dynasty in name, but when the Dynasty was overthrown by the Han Chinese Ming Dynasty in 1368, and with increasing local unrest in the Golden Horde, the Mongol Empire finally dissolved.